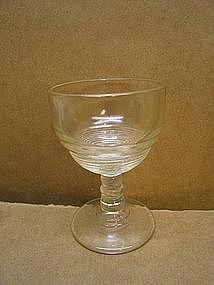 Vintage goblet with concentric ring on the bowl and stem. I do not know the manufacturer. 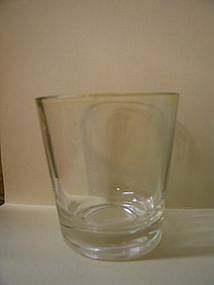 I've seen people call this depression glass, but don't think it is old enough. It holds 2 ounces and measures 3 1/2 inches in height. There is no damage. 2 goblets are available and priced individually. I need your zip code to calculate the postage. 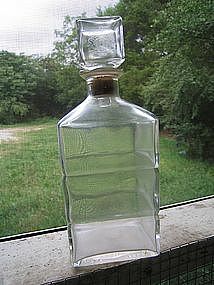 Vintage glass marked with F in shield. It holds 7 ounces and measures 3 1/4 inches in height. There are no chips, cracks, breaks or rough rim. I need your zip code to calculate the postage. 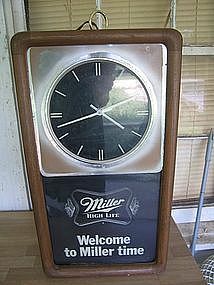 Vintage hanging clock and light. It is 22 inches in length and 12 inches in width. I do not know if it is in working order because it has been in storage for over 10 years. It shows a lot of aging to the materials and there are a complete set of condition photos available by email. I need your zip code to calculate the postage. 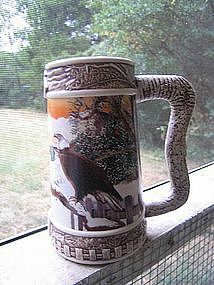 This ceramic stein is part of the America's Majestic Wildlife Collector Stein Series. This one is entitled Winter's Guardian by Janice Forrester. It is numbered 22262. There is no damage. I always thought this was a Seagram's decanter, but when I compared the stopper emblem, it appears to be another brand. I would appreciate any information on the company. It holds approximately 26 ounces and is 9 1/2 inches in height. There are no chips, cracks, breaks or rough rim to either piece. Additional photos by email. I need your zip code to calculate the postage. 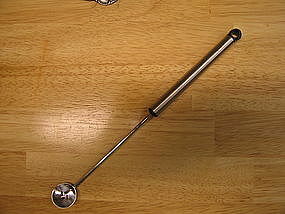 10 1/2 inch mixing spoon, which is part of a bar set. Light usage marks. Additional photos by email. I need your zip code to calculate the postage. 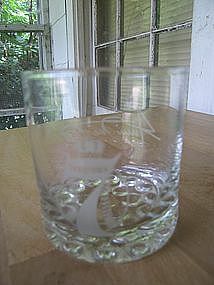 Seagram's 7 glass. It is 3 1/4 inches in height. I can't read the signature, but have tried to show in the photo. There are no chips, cracks, breaks, rough rim or loss to the finish. I need your zip code to calculate the postage. 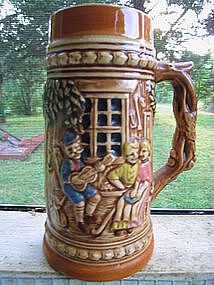 Vintage ceramic stein which holds 24 ounces and is 7 inches in height. There is no damage. I need your zip code to calculate the postage. Marked as made in Japan. 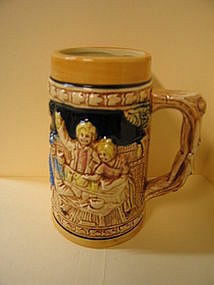 It holds 24 ounces and is 7 inches in height. There is no damage. Several mugs with different scenes are available. I need your zip code to calculate the postage. 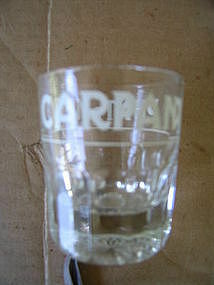 Vintage shot glass. There are no chips, cracks, breaks or rough rim, but has some usage marks. I need your zip code to calculate the postage. 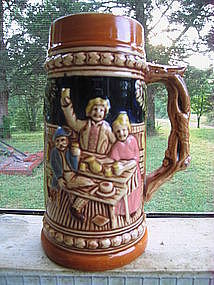 Vintage 5 1/4 inch stein marked Japan. There is no damage, but does have manufacturing flaws. I need your zip code to calculate the postage. 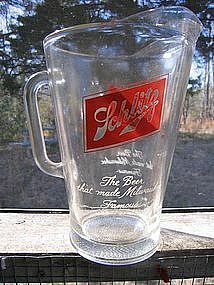 Vintage 56 ounce Schlitz Beer pitcher. There are no chips, cracks, breaks or rough rim. I need your zip code to calculate the postage. 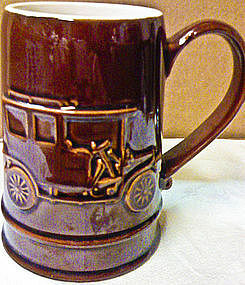 Vintage 24 ounce stein with embossed antique car. There is no manufacturing information. There are a few superficial scratches and a couple of small glaze misses. I need your zip code to calculate the postage. 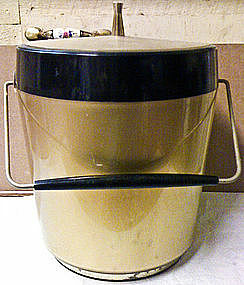 Vintage one gallon thermal ice bucket marked as N.F.C. There is no structural damage to the bucket or lid, but there are superficial scratches to the exterior and wear to the finish of handle and band around the bottom. I need your zip code to calculate the postage. 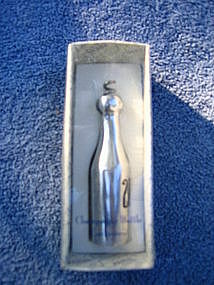 Champagne bottle shaped corkscrew sold during the 2000 millennium celebration. It is unused and still in the original box. Additional photos or information by email. I need your zip code to calculate the postage. 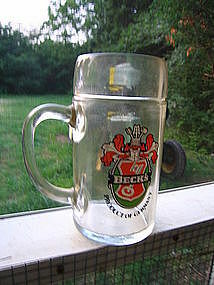 Vintage stein with the Beck Beer logo. It is marked as 1 liter. The bottom has a K as well as other manufacturing information that I am not familiar with. 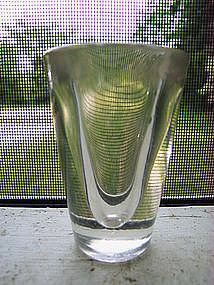 It has very little sign of use, but does have some manufacturing flaws in the glass. Photos by email. I need your zip code to calculate the postage. 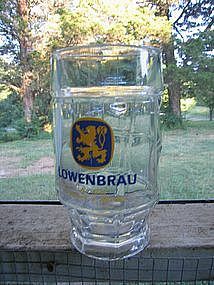 3 ounce glass measuring almost 3 inches in height. Thick base with starburst on the bottom. No chips, cracks or breaks. Photos by email. I need your zip code to calculate the postage.